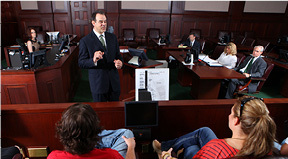 At the heart of The Dill Firm’s mission is your defense — at trial and on appeal — in all state and federal courts. Our experience in the defense of large-loss vehicular accidents, medical malpractice, employment law, workers’ compensation, products liability, admiralty, commercial disputes, and ERISA defenses means no matter what they throw your way, we’ll protect you. No matter what they throw your way, you can count on us to make sure your best interests are protected. Here, every case is personal, and every case, we fight to win.